Although Stephen Hawking was an atheist, his final warning about the future deserves attention. He considered near earth objects (NEOS) a top threat of extinction to humanity. NEOs continually do threaten earth and pass harmlessly—so far. Although scientists are concerned, Christians probably fear missing the rapture and facing the Antichrist a lot more than such an Armageddon/Deep Impact scenario.If they only realized that there is an explicit prophecy of an asteroid impact on earth before the rapture and Great Tribulation even happens. Learn this prophecy and how the Bible indicates it happens...and where the righteous will be protected from it. What is the Real Threat To Us? If you asked a Christian what threat they fear most, typically they would say the Antichrist, the mark of the beast, missing the rapture/the Great Tribulation or some other major aspect of end time Bible prophecy (or conspiracy theory, like a coming "New World Order"). Few if any would say they fear an asteroid impact on earth in their lifetime, such as the sci-fi films Armageddon or Deep Impact depicted. Although the chance of a disaster to planet Earth in a given year may be quite low, it adds up over time, and becomes a near certainty in the next thousand or 10,000 years. There was a powerful demonstration of this fear in 2013, the year that the Chelyabinsk meteor exploded into pieces above Russia (injuring 1500 people). All it takes is an object 150 yards (140 meters) wide to devastate a large city. While asteroids that size only have a one in 20,000 chance of hitting earth in any given year, the threat is serious enough that we have started a concerted effort to track all objects that size and larger. Unfortunately only 10% of the estimated 13,000 to 20,000 city-leveling asteroids have been detected. Worse, at the current rate, it will take until 2030 before we reach the more comforting level of 90% discovery. But even if we had 100% tracking of threatening near-earth objects today, there is still a problem. According to John Holdren, a presidential science adviser, we would need five years advance warning in order to prepare and execute a plan to try to neutralize a collision threat. This would be attempted through various possible means including nuking it, Bruce Willis-style. When space agency chief Charles Bolden was asked what would NASA do if a large asteroid was discovered to be on a collision course with earth three weeks before impact, his answer was not comforting. He said, “The answer to you is, 'if it's coming in three weeks, pray.'" Obviously, that's not very comforting news for most. Revelation 8:8-9 (HCSB) — 8 The second angel blew his trumpet, and something like a great mountain ablaze with fire was hurled into the sea. So a third of the sea became blood, 9 a third of the living creatures in the sea died, and a third of the ships were destroyed. The biblical description here is uncommonly clear. Astronomers actually describe asteroids as “mountains in space.” Obviously, not literal mountains hence the "something like" qualifier in Revelation is perfect. Further, as asteroids pass through the atmosphere prior to impact, they light up—not from friction, but from “ram pressure” (compression of the air in front of the body). This matches the “blazing fire” described in the prophecy. Since most of the earth's surface is ocean, the most likely place for an impact like this is the ocean, just as described. Thanks to the movies, most everyone knows these days what certainly must follow that: tsunamis or tidal waves would radiate out from there, destroying the ships. How do the fish die? The burning asteroid will boil and dirty the water at splashdown leading to mass deaths of sea life. That's an amazingly specific description of an asteroid impact for a first century writer! Some point out that, since it does not say where the mountain is thrown into the sea from, it is not safe to conclude it came from space. An alternative proposal therefore is that underwater volcanoes may be responsible for "throwing up" such a mountain up into the air and then back down to the sea. Volcanoes are an interesting idea since they explode with pyroclastic flows (a hot avalanche of rock, ash and gas) and pyroclastic surges (a cloud of volcanic ash and hot gasses exceeding 100 km per hour). However, neither of these volcanic expulsions could be described as like a mountain being hurled nor is there a record of a volcano ever throwing an entire mountain up into the air. (How would it stay together from the explosion? And how would it be burning since it is only a dislodged mountain?) The only way a mountain can both be in one piece and on fire at the same time is if it came from space. The space object interpretation best fits the surrounding context, too. If you review the preceding (1st) trumpet and the following (3rd) trumpet, you will find that both have to do with objects in space. Not only that, but the sixth and seventh seal before all that also do. An asteroid impact fits right in with that series. I said earlier that this happens before the rapture. That's because the Great Tribulation (before which most people think the rapture happens) does not come until the 5th trumpet when Satan is cast to earth to begin his wrath. The 5th trumpet is exactly three trumpets after this asteroid impact happens at the 2nd trumpet. God has different plan than the rapture to save his people from pretribulation threat events like this. What events lead up to the asteroid ocean impact we've been talking about? This is where it gets tricky and is why Christians are commonly missing this event on their end time roadmap. There is a chain of causality that is not obvious without a lot of consideration of that trumpet passage and related passages. This especially includes the other trumpets surrounding the 2nd trumpet including the 6th seal, 7th seal, 1st, 3rd and 4th trumpets. Revelation 8:10-11 (HCSB) — 10 The third angel blew his trumpet, and a great star, blazing like a torch, fell from heaven. It fell on a third of the rivers and springs of water. 11 The name of the star is Wormwood, and a third of the waters became wormwood. So, many of the people died from the waters, because they had been made bitter. Note that wormwood is also a bitter herb, so by naming the star Wormwood they are blaming it for what happened to the waters. But that's a strange detail because any straight impact of an object with earth would not just contaminate drinking waters. It would do much more damage across the board. So what kind of interaction between Wormwood and earth could be intended? For sure a star colliding with earth is not what is being described. A normal star like our Sun could not even come close to the earth without torching and ripping apart earth long before any impact could happen. The waters would be evaporated, not contaminated. So this passage makes no sense in English translations using the word specific word star. Before you can make any sense of Wormwood one must research the word translated "star." The Greek word there is aster (as in asterisk). Importantly, it turns out to not be specific to a star like, say, the Sun. The word is used to describe planets, comets and, yes, asteroids, too. Basically anything in the sky apart from the Sun and Moon. So which kind of "star" is being described? I've concluded that it's not even any of those above that most people know about, but a new type that was only recently defined (in 2006). I'm talking about the dwarf planet. These are planets that tend to be smaller than Mars, but larger and rounder than asteroids. 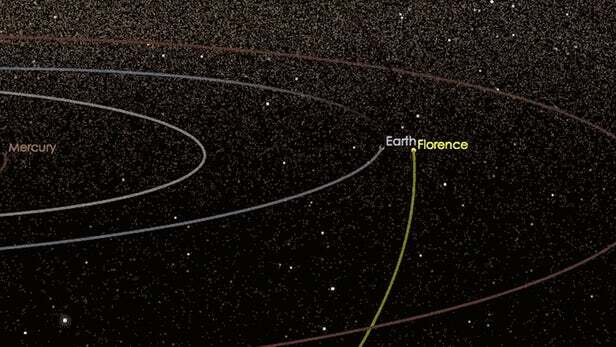 If a dwarf planet "star" were to narrowly miss earth, it could explain everything described. Because Wormwood disintegrates, it provides the volumes of material described from the 6th seal through the 3rd trumpet that fall to earth and fill and block the sky. Wormwood's mass of material is transferred to earth as it disintegrates on its way. This is how star (dwarf planet) Wormwood "falls upon the earth" without causing total destruction and death. It falls in pieces small enough for the earth to absorb and some life to survive. If the 3rd trumpet asteroid comes from a rogue, undiscovered dwarf planet (Wormwood), obviously you won't find it on the Near Earth Objects (NEO) tracking lists of NASA. This means you don't have to pay attention to the reports released several times per year about the latest asteroids to barely miss earth. You can cancel your google alerts on that. They are not going to help you predict when the Wormwood prophecy is fulfilled. The fact is, nothing in the regular news will alert you in time to prepare for the Wormwood disaster. We can be sure of this from Revelation 6:12-17. It shows that (somehow) Wormwood comes as a surprise on humanity without much warning to prepare. "Running for the caves in the mountains" indicates a almost complete lack of preparation and panic (Rev 6:15-16). No indication of the many bunkers that could be built during the ten years from when the dwarf planet was spotted on a collision course. While it is discouraging to see scientists' fears of a global impact event confirmed in Bible prophecy, there is no cause for fear among believers. God will not leave us on our own to face such a terrifying event. If he did few would survive. Joel 2:31-32 (ESV) — 31 The sun shall be turned to darkness, and the moon to blood, before the great and awesome day of the LORD comes. 32 And it shall come to pass that everyone who calls on the name of the LORD shall be saved. For in Mount Zion and in Jerusalem there shall be those who escape, as the LORD has said, and among the survivors shall be those whom the LORD calls. God has to call and help people to get to the one safe place he sets up to save his people who call on him. To understand how God calls us and helps us to get this "place of safety" in the Zion/Judea area, please continue on to my article on Psalm 91's description of this "secret place of the Most High." 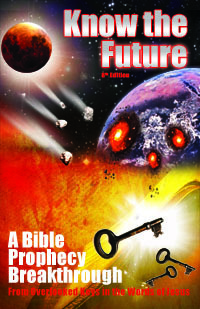 Or consider my book Know the Future for the entire comprehensive end time roadmap and plan of God. If the future “Wormwood” rogue sun or planet or asteroid sets the solar year and the moon cycle back to the conjectured original Edenic-to-Deluge 360 days/year and 30 days/month. Then the annual duration and months’ crescent moons will be predictable thereafter by everyone, hence 1st. of Tishri (Yom Teruach) will be foreknown by believers. So why not deal with that foreknowing of the 2nd. Advent scenario here? Matthew 24:36 (KJV 1900) But of that day and hour knoweth no man, no, not the angels of heaven, but my Father only. Stephen, Yeshua never said “no man WILL EVER know.” We WILL know after a point, such as the 1290 days from the Abomination till the rapture. His phrase speaks of a present hidden condition of the day of his coming (that is still ongoing) and it hints at Yom Teruah. It does not matter if Yom Teruah changes back to its original knowable timeframe on a restored 30 day lunar cycle. When Yeshua made the statement it was true and did not preclude that condition changing. it will pull many pieces from the asteroid belt along with it. When you have time please watch some of Red Elk’s video’s on YouTube (God rest his soul) namely his series Red Elk Native Indian Prophecy and Red Elk Church of Christ. I agree with you more after reading 1 KINGs 13:9 about the gift of discernment. This requires OBEDIENCE and a servant heart. I am still developing this gift. Good work Tim, your work on the second trumpet I believe is accurate, currently seeing 2026 as the possible beginning (seals being opened etc.) we can expect the second trumpet to be fulfilled around 2028, once the Identity of the opening of the first seal is reveled, for those who have been allowed to know the plan will accurately be able to forecast the events of the tribulation leading into great tribulation when satan and his followers are confined to the location of the earth which should be right around the fifth trumpet. Mark, when an object passes by earth and breaks up (6-7 seals, 1-4 trumpets) it does not take two years. =) I’d guess closer to two hours to two days. This article (sorry if you’re offended by Fox news) and the embedded links give some of the better background I’ve come across to help provide basis for the events described in Rev. 6. It may not be a direct fly-by of planet X itself (or 9) that causes everything but something this massive on its way back toward the center of our solar system is definitely going to be dragging massive amounts of space debris (asteroids) along with it. Ethan, this type of object does not help explain Rev 6. They are too big and too far out and they would never sneak up on the population like Rev 6 says. The “debris field” idea is one I used to teach but such things are not reality and certainly not dense enough with a near miss flyby to explain all the material falling to earth in Rev 6-8. Only a smaller planet being pulled apart by Earths’ gravity towards earth would create this. Amakiri, won’t happen. Jesus will be reigning then and will protect us after going through God’s wrath just before! It is the Adriatic Sea that the asteroid falls into not the Mediterranean. elements of northern Italy will rebel against Vatican City & catholic fanatics. unite in central Europe. In Jesus, C.C. April 6-19.